3.8 x 5.2 x 11.6 in. In May 2010, Sony made its debut in the single-lens direct view camera market, when it launched the first two models in its NEX-series lineup -- the Sony NEX-3 and NEX-5. Both cameras are based around the combination of an APS-C sized 14.2 megapixel Sony Exmor CMOS image sensor and a BIONZ image processor, and both accept interchangeable lenses courtesy of Sony's brand-new E-mount. 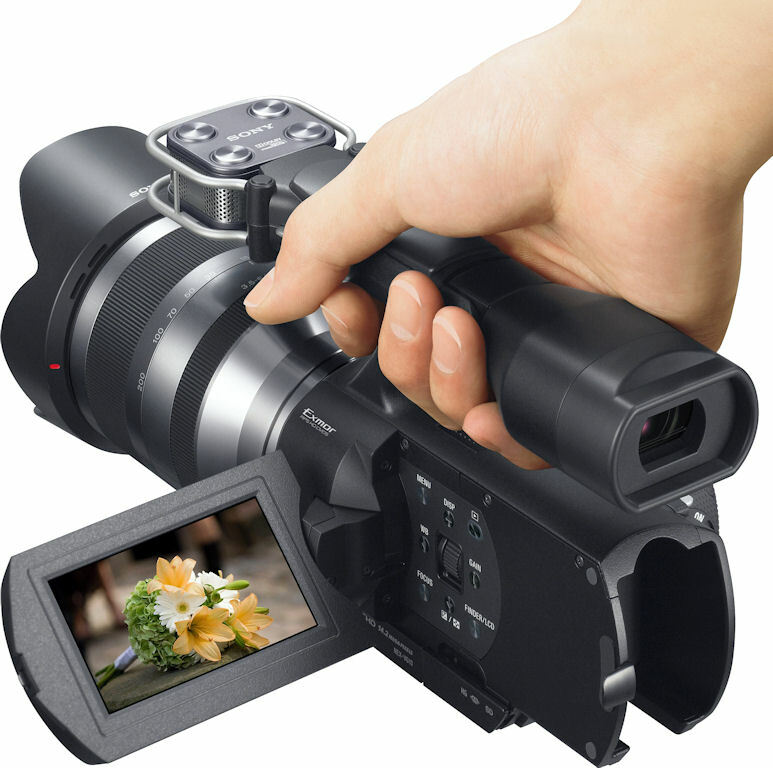 The NEX cameras offer not only still image shooting capabilities, but also the ability to capture high definition movies at up to 720p resolution in the NEX-3, or 1080i in the NEX-5. The new lens mount brought an opportunity for a simultaneous ground-up rethink of the lens design, bringing some definite advantages for video shooting as compared to competing products. The NEX cameras both offer continuous autofocus that's genuinely useful during movie recording, as well as stepless iris adjustment to prevent sudden shifts in brightness as the aperture changes. Certain design choices made in both cameras -- and especially their extremely compact body styling -- indicate that their main focus is on still image shooting, however, with the video functionality merely providing a useful stop gap on short clips, or when a dedicated camcorder isn't available. Recognizing this, Sony took pause alongside the launch of the NEX cameras to announce that it was also developing an interchangeable lens camcorder. 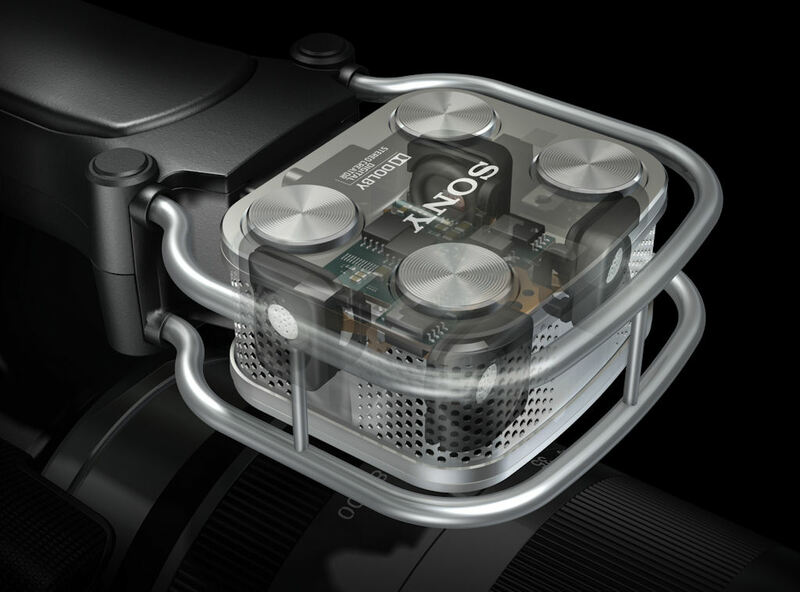 The design was to share the same Sony E lens mount as the NEX cameras, allowing lenses to be shared between both product lines. Just a few short months after the 25th anniversary of Sony's famed Handycam camcorder line, the Sony NEX-VG10 makes good on that promise, borrowing much of the feature-set of the Sony NEX-5, but placing it in a body design that's much better suited for video capture, and with a variety of other hardware and firmware changes that combine to make the NEX-VG10 a genuinely exciting product for video capture. 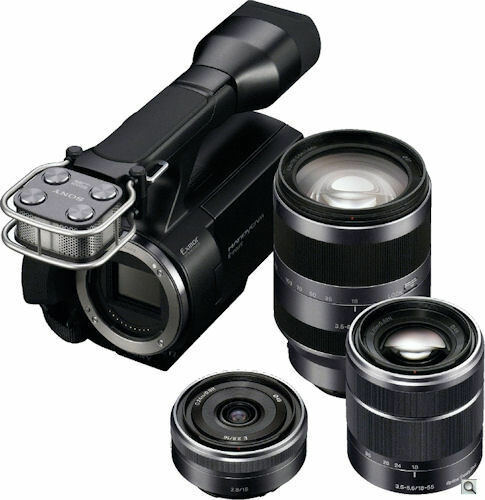 Sony's NEX-VG10 camcorder is compatible with the same E-mount lenses as the NEX-3 and NEX-5 single-lens direct view cameras, and can also accept Alpha-mount lenses with an optional adapter, albeit without support for autofocus or SteadyShot image stabilization. In most respects, the body of the Sony NEX-VG10 camcorder is pretty similar to that of the concept model the company showed last May, but with the addition of an aggressively styled T-shaped bar that projects from the top of the body. This bar serves as three purposes, with the most immediately obvious being a handle with which to grip the camera when shooting below eye level, or during transport. The bar also includes an electronic viewfinder eyepiece at its rear, and a housing for the VG10's built-in microphone array at the front. With the exception of this bar and the interchangeable lens mount, the Sony VG10's design is -- while quite angular and modern in a manner reminiscent of the compact NEX-5 -- actually fairly conventional. The right side of the VG10's body includes a hand strap that gives a secure grip, with the base of the camcorder resting n the palm of the right hand, and shooting controls falling naturally under the right thumb. Handy handle. The T-bar that runs the length of the VG10's top deck serves several purposes -- electronic viewfinder at rear, stereo mic at front, hot and cold shoes under a cover at center, and of course it also serves as a convenient handle for transport, or when framing shots low to the ground.. The left side of the body includes a roomy 3.0" TruBlack Xtra Fine LCD display with 921,600 dot (640 x 480 pixel) resolution, identical to those on the NEX-series SLD cameras, but mounted on the traditional camcorder style -- folding outwards 90 degrees from the side of the VG10's body, and then swiveling to point vertically upwards or downwards, or anywhere in between. (Like most camcorders, the VG10's LCD cannot be pointed forwards). The remainder of the controls, including several buttons and a jog dial, are all located behind the LCD panel. This keeps them safe from accidental presses when the VG10 isn't in use, and makes them easy to find with your free left hand while shooting videos. Interestingly, the NEX-VG10's 0.43-inch electronic viewfinder doesn't have the same 4:3 aspect ratio as the LCD display, and hence has a slightly higher dot count, with its wider 16:9 aspect ratio resulting in a resolution of 1,152,000 dots (800 x 480 pixels). The viewfinder has three step brightness adjustment, a large rubber eyecup that helps keep out stray light, and can be angled upwards for a lower shooting angle. Image quality for the VG10 will likely prove extremely similar to that of the NEX-5, since the VG10 uses the exact same lenses, image sensor, and image processor -- but there are a couple of important differences in terms of video and still image file formats. The VG10 drops the still image Raw file format of the SLD-format cameras, as well as the MPEG-4 video format, but boosts the bitrate of the 1,920 x 1,080 pixel 60 / 50i AVCHD video mode to 24Mbps, up from 17Mbps in the NEX-5. (The NEX-3 lacked the ability to record videos at this resolution, or in AVCHD format.) 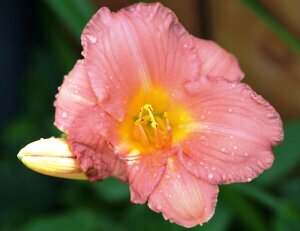 Note that like the SLD cameras, the 60 / 50i video is created from 30 / 25p sensor output. Given the interchangeable lens capability, dust is an important issue for the NEX-VG10 camcorder, just like it is for still image cameras. (Perhaps more so given that static dust specks could prove even more noticeable against a moving backdrop.) Thankfully, Sony has included the same anti-dust technology as in the NEX single-lens direct view cameras, combining a charge protection coating on the low-pass filter, and an electromagnetic vibration system that aims to shake stubborn dust particles free. 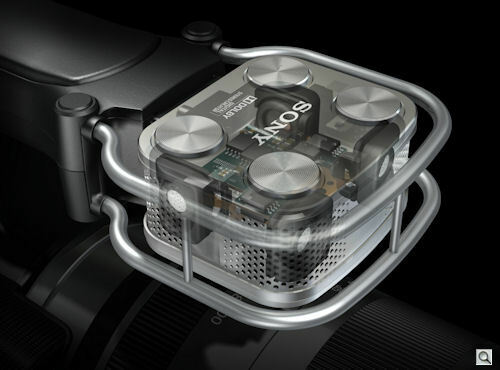 Among the standout features of the Sony NEX-VG10 is its quad capsule spatial array stereo microphone, shown here in cutaway view. Comprising four separate omnidirectional cardioid microphone capsules, the VG10's mic is said to offer a 2x increase in directivity when compared to that of Sony's previous HDR-CX550V camcorder. Beyond the body design, perhaps the most important difference in the NEX-VG10 that makes it a better video tool than the NEX-series compacts is its sound recording capabilities. Where the single-lens direct view cameras used a built-in dual pinhole stereo microphone, or optionally a small, proprietary external stereo microphone, the VG10 offers improvements in both internal and external sound recording. The VG10's internal microphone is a quad capsule spatial array stereo design, based around four omnidirectional cardioid microphone capsules. The Sony VG10 uses three of the four microphones when reconstructing the sound for each stereo channel-- both front mics, plus the rear mic on the relevant side for the left or right channel. Sony is claiming the NEX-VG10's microphone array design offers a 2x increase in directivity when compared to that of the existing HDR-CX550V camcorder. In addition to the improved internal microphone array, the Sony NEX-VG10 also includes two standard 3.5mm audio jacks -- one for a stereo microphone input, and the other for stereo headphones, allowing audio quality and clarity to be confirmed in-situ. Volume of the headphone or internal speaker can be adjusted manually in 15 steps, but record levels cannot be altered. 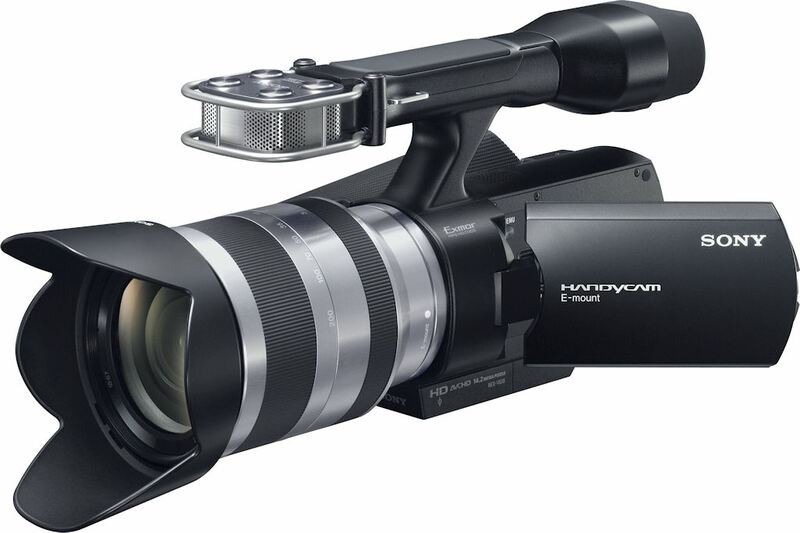 Allowing for an external microphone to be mounted on the camcorder without disrupting still image flash capabilities, a flexible compartment door on the top of the mic / EVF / handle bar conceals both a hot shoe for external flash strobes, and a cold shoe on which to attach a microphone mount. Two shoes. The Sony VG10 sports both hot and cold shoes on its top deck, safely hidden until they're need under a rubber compartment door at the center of the T-bar handle. The hot shoe caters for Alpha flash strobes, the cold shoe is useful for accessories like microphone mounts. A couple of other differences between the camcorder and single-lens direct view NEX models make the VG10 better suited to video capture. Where the NEX-5 is limited to a maximum clip length of 29 minutes and 50 seconds, the VG10 has no such limit, and can record for as long as there is available card space / battery power. The Sony NEX-VG10 stores its videos and still images on Secure Digital cards (including their newer SDHC and SDXC types), or on Sony's own Memory Stick PRO Duo cards (including Memory Stick PRO-HG Duo). Sony states that with a 32GB memory card, the NEX-VG10 should be capable of recording up to four hours of high definition footage at its 1,920 x 1,080 pixel resolution, in FH mode. The NEX-VG10 also uses a higher capacity battery type that offers greatly increased battery life. Where the NEX-5 uses a 7.7 watt-hour, 1080mAh InfoLithium NP-FW50 battery, the NEX-VG10 accepts Type-V Stamina batteries, allowing a life of up to 415 minutes when using the 26.5 watt-hour, 3,900mAh InfoLithium NP-FV100 battery pack. Traditional camcorder layout. The Sony VG10 adopts a fairly standard layout, with a folding LCD screen that can swivel straight up or down (but not forwards,) behind which reside a number of less frequently accessed controls. 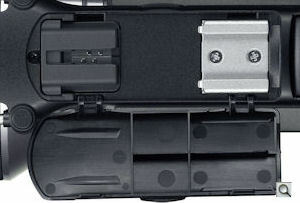 The main shooting controls are on the opposite side, positioned nicely for a touch of the thumb. 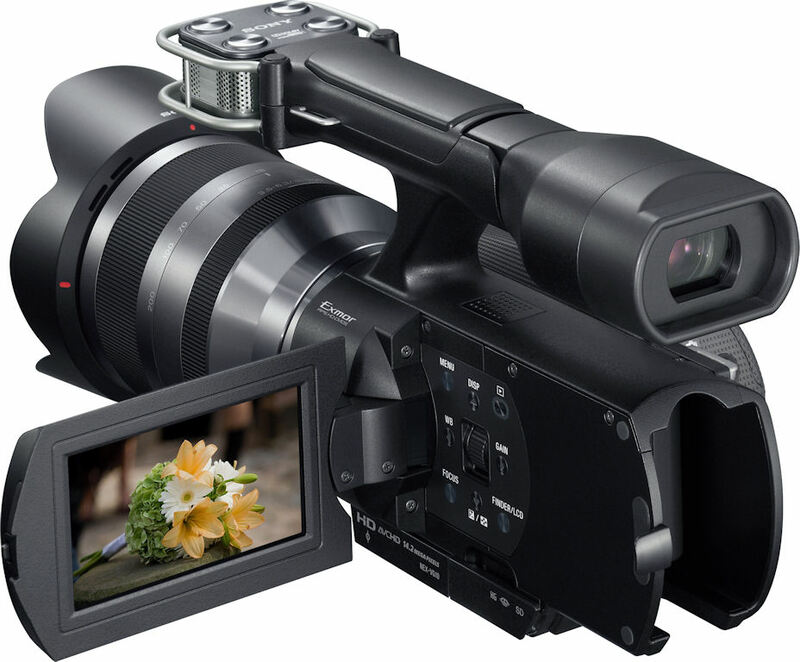 Aside from the removal of Raw shooting capability (and the significantly more compact / discreet camera bodies), the Sony NEX-VG10 retains the majority of the still-image capabilities of the NEX series SLD cameras. The VG10 can shoot still images at 14.2 megapixel resolution, and even retains more advanced capabilities like Auto HDR, Handheld Twilight, and Anti Motion Blur, which combine multiple shots in-camera to increase dynamic range, reduce noise, and freeze motion. In still image shooting, the VG10 offers ISO sensitivity equivalents from 200 to 12,800, and shutter speeds from 30 to 1/4000 second. Continuous burst shooting is possible at seven frames per second, for up to 14 frames. Thanks to its larger body, the NEX-VG10 even offers an advantage over the SLD models for still image shooting -- where the NEX compacts are limited to using a small, proprietary flash strobe with relatively low power, the VG10 can accept a standard shoe mount Sony Alpha flash strobe, providing significantly greater flash power. The Sony NEX-VG10 goes on presale in the United States from July 14th 2010, and is slated to begin shipping from September 2010. Pricing has been set at just under US$2,000, including an Active SteadyShot-compatible E-mount 18-200mm F3.5-6.3 OSS lens -- an impressive value considering that this lens alone regularly costs $800. Sony has actually squeezed in a little more value by including a free download voucher for its Sony Vegas Movie Studio 10 software in the NEX-VG10 bundle, with that software carrying a list price of $99. If one considers the list pricing for the lens and software together, that effectively makes the list price for the NEX-VG10 body just $1,100 -- only $400 more than that of the NEX-5 camera body.